You will find this feature in Icy Phoenix 1.2.18.45 Beta 1 and future versions. No doubt you have noticed the new Ads & Sponsors feature in the latest version of Icy Phoenix. 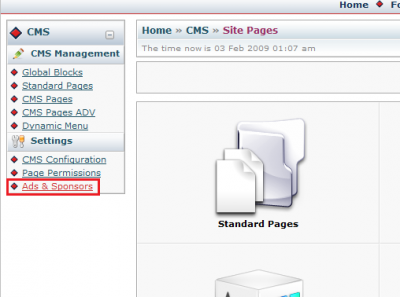 You've also probably noticed the new ads [Ads] block in the CMS. These two are not to be confused as they are two separate entities. 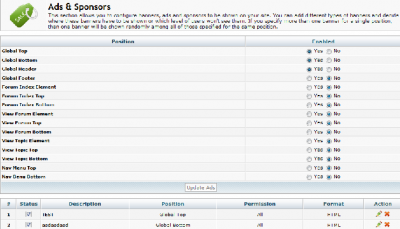 This guide will help to describe how you can work with the Ads & Sponsors feature. First, head to your CMS menu and click the Ads & Sponsors link under Settings on the left. Global - Global refers to site-wide. Add an ad to a global position and it shows on every page of Icy Phoenix. 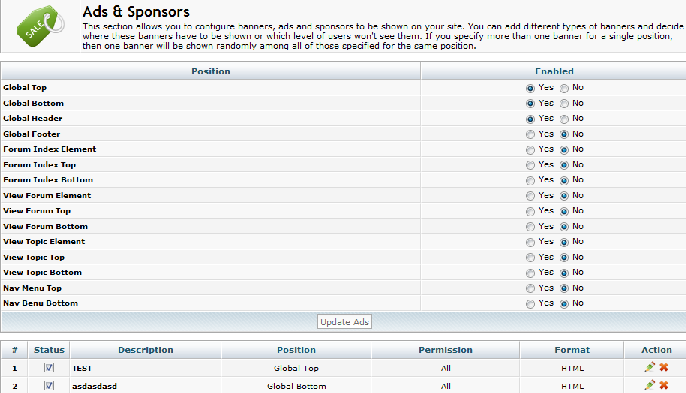 Forum - Forum refers to ads being positioned on the forum index. Nav Menu - Nav Menu refers to ads being positioned on top or bottom of the top navigation bar. 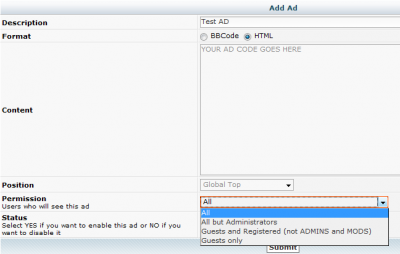 Enable the positions you plan to create Ad "blocks" for by ticking the radio buttons and then click ADD AD at the bottom. Don't forget which positions you enabled! You are able to use HTML or BBCode in the text field. If you do not participate in any AD activities, you could use this to display simple text. 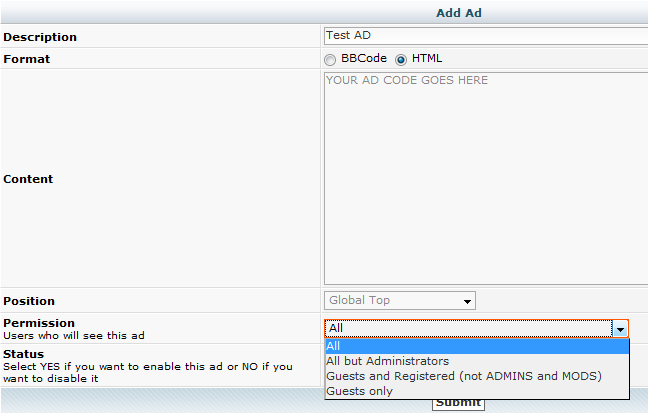 If you use Google AdSense, AdBrite, etc., you could enter the AD code in this text field to display your provider's AD. Administrators will love not seeing their own ads because in some cases, administrators viewing their own ads can be a very negative thing to the ad providers. This also clears everything out so you can get a better idea what is on your site. We believe there was a small problem with Google Adsense not displaying ads correctly with the latest IP beta. This should be fixed in the next beta release! Looking for the Ads & Sponsors link? You can find it in the header of your main CMS menu or on the left in the CMS. there to set the pop up mod like on this page. I'm sorry, what was that Spydie? These specific ADS on IP.com are going to be removed very soon. Be patient a bit more... I should have removed all for registered users.